Over 700 new graduates were capped by the Chancellor of the University of Stirling, BBC radio broadcaster Dr James Naughtie, during three graduation ceremonies in Stirling’s Albert Halls. Among them was Claire Maternaghan from East Lothian, who graduated with a PhD in Computing Science and had to take a day off to graduate in the first week of her new job with Google. Claire was approached by Google to apply for one of their highly competitive internships earlier this year. Initially applying to work in Google Europe, Claire was persuaded by the company to go to California, where the work there was similar to her own PhD research. For her thesis, Claire developed Homer, an integrated program to control all the different forms of technology we have in the home – central heating, lighting, music – and make it easy for anyone to control it through an app on their computer or phone. Claire says: “I wanted to find a way to make it easy for anyone to be able to control technology in the home intelligently, allowing personal daily routines to be automated - such as waking up to fresh coffee from the coffee machine or locking all doors and turning off all lights when going to bed. “There has been a lot of research in this field and I was interested in trying to make it as simple as possible. As an intern this summer, I worked with Google on their home automation team and used a lot of my own PhD research. “Now I have started a full time job at Google, working with their android search team. This is such an exciting company to work for, and really is a dream come true. 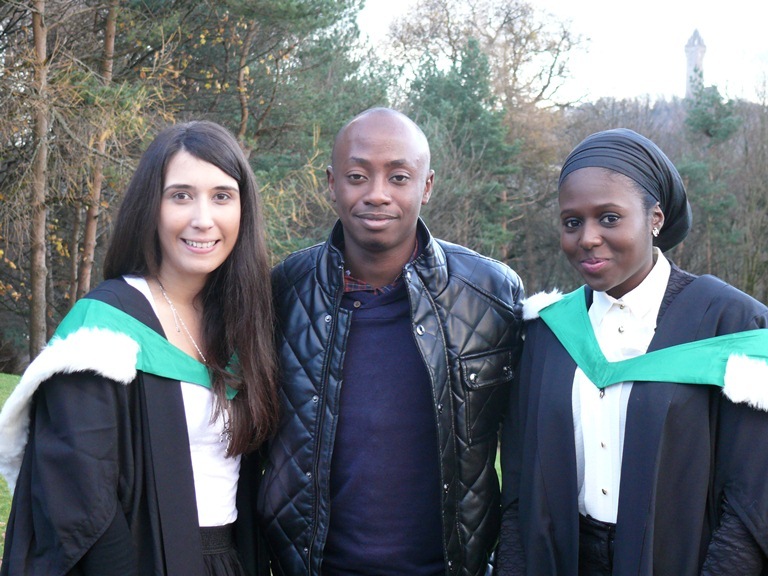 “The Computer Science and Maths department has been amazing throughout my eight years at Stirling - as an undergraduate and a postgraduate - and has really helped me in getting where I am today. Another graduate today is Mary Ross Davie, a clinical midwife who, after 15 years working in the profession, received the first Royal College of Midwives PhD studentship to study the promotion of normal birth. In the largest UK study of midwifery support carried out to date, Mary undertook observations of women’s experiences in labour using SMILI - a new observation instrument developed at the University of Stirling - to record the quantity and quality of midwifery support in labour. “I wanted to have a way of finding out what is the content of the one-to-one midwifery support that women receive in labour and relate it to the outcome of that labour,” says Mary. “Care should be evidence based, but there was little evidence of the benefits or otherwise of using humour, empathy or emotional support to assist women in labour. “My research showed that a midwife is in the room with the woman giving birth for 92% of the time on average. Where the midwife is in the room, the woman is more likely to have a normal delivery. Where there is a higher level of emotional support from the midwife, the woman is more likely to have a normal delivery and more likely to be satisfied with the experience of giving birth. Mary is now working for NHS Education for Scotland, working on education for maternity care professionals and her research will be published in the coming months. Also graduating is Scotland hockey international Alison Bell, who completed a third degree in sport. She gained a PhD in Sports Coaching today to add to undergraduate and postgraduate qualifications in Sport Management. Originally from St Andrews, Alison has 90 Scotland caps to her name and ten years competing for Grove Menzieshill HC in Dundee. She scored for Scotland at the Delhi 2010 Commonwealth Games and is intent on another major games appearance closer to home. Meanwhile, she has started work as a Sports Development Officer at the University of Abertay in Dundee.